The Islamic State (ISIS) has released a picture of the “suicide bombers responsible for the Easter Sunday attacks in Sri Lanka”. The image was released by Amaq news agency, the official mouthpiece for the group. ISIS had earlier claimed responsibility for the suicide bombings which led to the deaths of over 300 persons, saying it targeted Christians and Sri Lanka citizens. “Those, who carried out the attack that targeted the citizens of the coalition and Christians in Sri Lanka the day before yesterday were Islamic State fighters,” Amaq reported on Tuesday. #BREAKING: ISIS release a portrait photo of the seven terrorists responsible for the #SriLankaBombings standing in a row. Also, notice the 8th terrorist standing behind the second one from the right. While all the suspected bombers covered their faces, Zahran Hashim, an extremist cleric, left his open. The picture was taken in front of an ISIS flag. There are also reports identifying Hashim as the mastermind of the attacks. The group had previously named the bombers alongside Hashim as Abu Ubayda, Abu al-Mukhtar, Abu Khalil, Abu al-Bara’a, Abu Muhammad and Abu Abdullah. The death toll from the multiple suicide attacks at churches and hotels in Sri Lanka over the Easter weekend rose to 321 on Tuesday, the national day of mourning for the victims. There are reports that the bombings were intended as retaliation for last month’s attack against Muslims in Christchurch, New Zealand. The United Arab Emirates on Tuesday unveiled a new branch of government, a Ministry of Possibilities, three years after launching a department in charge of happiness. Sheikh Mohammed bin Rashid Al-Maktoum, the UAE’s premier and ruler of Dubai, said the “unconventional” ministry would function “without a minister” but with input from the whole cabinet. “We launched the world’s first virtual ‘Ministry of Possibilities’, a new government work system in the UAE,” he said on Twitter. It would also cut waiting times for government services, according to the Dubai government’s media office. In 2016, the UAE created ministries of happiness and tolerance. President Donald Trump has accepted Queen Elizabeth’s invitation to make a state visit to Britain in June, Buckingham Palace said on Tuesday. Trump and his wife Melania will make the trip from June 3 to June 5, the palace said, adding that further details would be announced in due course. Trump will hold a meeting with British Prime Minister Theresa May in Downing Street and the trip also coincides with events to mark the 75th anniversary of the D-Day landings during World War Two. “The UK and U.S. have a deep and enduring partnership that is rooted in our common history and shared interests,” May said in a statement. The Trumps met the queen for tea at Windsor Castle on their last trip to Britain in July, which was not deemed a state visit. The Islamic State has claimed responsibility for the suicide bombings which led to deaths of 310 persons in Sri Lanka. Suicide bombers struck in churches and hotels in the country on Easter Sunday. In a statement carried by the extremist group’s mouthpiece Amaq, the group said it targetted Christians and Sri Lanka citizens. The statement referred to the US-led coalition, which has been fighting the extremist group in Iraq and Syria since it took over large areas in the two countries in 2014. The death toll from multiple suicide attacks at churches and hotels in Sri Lanka over the Easter weekend rose to 321 on Tuesday, the national day of mourning for the victims. Police said that the increase was due to more people succumbing to injuries. The bombings in Sri Lanka were intended as retaliation for last month’s attack against Muslims in Christchurch, according to initial investigations by the Sri Lankan government, the deputy defence minister said. “We believe [the massacre] was carried out by an extreme Islamist group as a reprisal to the Christchurch mosque massacre in New Zealand,” Ruwan Wijewardene, minister for defence, in a statement to parliament. Wijewardene’s comments came as security forces and police searched the capital for a lorry and a van fitted with explosives identified by police in an intelligence report. “The search is in progress, but nothing suspicious has been found so far,” a police officer said. Police checked several motorcycles, cars, unattended parcels and other locations. The UN Children’s Fund (UNICEF) said in Geneva that 45 children were killed and dozens were injured in the suicide attacks. “No child should experience such a heartbreaking situation and no parents should lose their child forever under such horrible circumstances,” UNICEF spokesman Christophe Boulierac said. Three minutes of silence were observed as more funerals of those killed in Sunday’s attacks took place. Black and white flags were also raised in most towns as symbols of mourning. The country has been under a state of emergency since late Monday. High security was being maintained in Colombo and in Negombo, 35 kilometres bombings north of the capital, where a mass burial took place close to a church where more than 110 people were killed. The state of emergency gives security forces special powers, including the right to search and arrest individuals. The Rwandan minister of Infrastructure, Claver Gatete his struggling to refute the allegations which has gained currency in the country. He, on Monday, denied claims that China may have inserted some spying equipment in building. He said Chinese engineers have been working together with their skilled Rwandan peers to ensure that the new complex building met all required standards. Speaking after the inauguration of the office complex which cost $ 27 million donated by China, the official labelled the claims as “unfounded”. The Rwandan official was apparently reacting to the latest allegations that China’s government spied on the servers at the African Union’s Chinese-built headquarters for more than five years, gaining access to confidential information. The hack wasn’t detected until January 2017 when technicians noticed that between midnight and 2 am every night, there was a peak in data usage even though the building was empty. After investigating, it was found that the continental organization’s confidential data was being copied on to servers in Shanghai. China’s support to Rwanda’s development process is in the form of concessional loans, grants, technical support in infrastructure projects as well as scholarships for students in health, education and technology sectors. Anders Povlsen, one of the owners of British online fashion retailer, Asos, says three of his four children were killed in the Easter Sunday bombings in Sri Lanka. A series of blasts, most thought to be the work of suicide bombers, was targeted at churches and five star hotels in eight different locations. According to Daily Mail, spokesperson for the Danish billionaire confirmed on Monday that his children were on holiday in the south Asian country. A few days ago, one of Povlsen’s children, Alma, had uploaded an image of her three siblings, Astrid, Agnes and Alfred, lounging at a poolside. It is unknown which of his three children died in the bombings which have claimed at least 290 lives. Manisha Gunasekera, Sri Lankan high commissioner to the UK, said eight British nationals were killed in the attacks. Citizens of the US, China, Japan and Portugal were also killed in the bombing. No group has claimed responsibility but the police have arrested 24 suspects in connection with the incident. The police blamed the attack on National Thowheed Jamaath (NTJ), an extremist group which were the subject of an intelligence warning 10 days before the attacks. Two of the suicide bombers blew themselves up at the luxury Shangri-La Hotel on Colombo’s seafront, said Ariyananda Welianga, a senior official at the government’s forensic division. The others targeted three churches and two other hotels. A fourth hotel and a house in a suburb of the capital Colombo were also targeted, but it was not immediately clear how those attacks were carried out. “Still the investigations are going on,” Welianga said. There was no claim of responsibility for the Easter Sunday attacks, which mainly took place during church services or when hotel guests were sitting down for breakfast buffets. “Guests who had come for breakfast were lying on the floor, blood all over,” an employee at Kingsbury Hotel, one of those targeted, told Reuters. Cabinet spokesman Rajitha Senaratne said an international network was involved, but did not elaborate. The president, Maithripala Sirisena, said in a statement the country will seek foreign assistance to track the international links. Prime Minister Ranil Wickremesinghe acknowledged on Sunday that the government had some prior information about possible attacks on churches involving a little-known local Islamist group. A domestic intelligence report dated April 11 and seen by Reuters said a foreign intelligence agency had warned Sri Lankan authorities of possible attacks. Four of the bombs went off at roughly the same time on Sunday, at 8.45 a.m., with two others coming within 20 minutes. The explosions at the fourth hotel and the house were in the afternoon. Most of the dead and wounded were Sri Lankans although government officials said 32 foreigners were killed, including British, U.S., Turkish, Indian, Chinese, Danish, Dutch and Portuguese nationals. Denmark’s richest man Anders Holch Povlsen and his wife lost three of their four children in the attacks, a spokesman for Povlsen’s fashion firm said. The U.S. State Department said in a travel advisory “terrorist groups” were continuing to plot possible attacks in Sri Lanka and targets could include tourist spots, transport hubs, shopping malls, hotels, places of worship, airports and other public areas. The government announced a curfew in Colombo from 8 p.m. until 4 a.m. Separately, the president said a nationwide emergency will go into effect at midnight local time on Monday, granting police and the military extensive powers to detain and interrogate suspects without court orders. Buddhist-majority Sri Lanka was at war for decades with ethnic minority Tamil separatists but violence had largely ended since the government victory in the civil war, 10 years ago. Sri Lanka’s 22 million people include minority Christians, Muslims and Hindus. Police said on Monday that 24 people had been arrested, all of whom were Sri Lankan. The Sri Lankan military, who were clearing the route from Colombo airport late on Sunday in preparation for the return of President Sirisena from an overseas visit, found a crude bomb near the departure gate, an air force spokesman said. Traffic was uncharacteristically thin in normally bustling Colombo after an island-wide curfew was lifted earlier Monday. Soldiers with automatic weapons stood guard outside major hotels and the World Trade Center in the business district, where the four hotels were targeted, a Reuters witness said. Victims of the attacks included a British mother and son at breakfast at the Shangri-La, British media reported. An Australian survivor, identified only as Sam, told Australia’s 3AW radio the hotel was a scene of “absolute carnage”. He said he and a travel partner were having breakfast at the Shangri-La when two blasts went off. He said he had seen two men wearing backpacks seconds before the blasts. Questions over why the intelligence report was not acted upon could feed into a feud between the prime minister and the president. Sirisena fired the premier last year and installed opposition strongman Mahinda Rajapaksa in his stead. Weeks later, he was forced to re-instate Wickremesinghe because of pressure from the Supreme Court but their relationship is still fraught as a presidential election nears. Divine Oduduru has broken Nigeria’s thirteen years sub 10 seconds jinx in the 100 meters race. Oduduru broke his personal and season best records to set a world leading record of 9.95sec to win at the Michael Johnson Invitational on Saturday. He also broke Francis Obikwelu’s national record of 19.84sec set in 1999 in the 200 meters, with a new world leading NR and SR of 19.76s. Oduduru is the ninth Nigerian to ever run sub-10 in the 100m, and the second to go sub-20 in the 200m. “I worked for this,” Oduduru said after the race. “My coaches have always been telling me that I have to get into the moment where I can feel everything. “I want to say thank you to Coach [Calvin] Robinson for getting me to this point in my life and my career. “We have a great team, and I want to say thank you to everyone for their love and support. Just 122 sprinters in history have broken the 10-second barrier in the 100m, and only 72 sprinters have gone sub-20 in the 200m. “It’s something we do in practice,” he added. Olusoji Fasuba’s 9.85 second record set in 2006 yet to be broken. Fasuba’s record was one hundredth of a second better than the old record of 9.86 seconds that was set by Namibian track and field legend Frankie Fredericks a decade earlier. Fasuba is currently the ninth fastest 100m runner ever with a time below the 10-second mark. Among them were the Nicholsons who were having breakfast at the Shangri La hotel when the bombers struck. Anita Nicholson, 42, a lawyer and her son Alex, 11, died instantly. Her husband, Ben was seriously injured, while the daughter, Annabel is still missing, the Daily Mail reported. According to the newspaper, the family were living in Singapore, where Mrs Nicholson had worked for BP before joining mining company Anglo American. Mr Nicholson was a partner in the Singapore office of Kennedys Legal Solutions and advises clients on insurance law. Other victims mentioned were Shantha Mayadunne and her daughter Nisanga. They had posted a photograph of their breakfast before the attack. More than 500 people were injured in the Easter Sunday assault that saw suicide bombers hit three high-end hotels popular with foreign tourists and three churches, unleashing carnage in Colombo and beyond. There was no immediate claim of responsibility, but police said Monday 24 people had been arrested, over the country’s worst attacks for more than a decade. The government is wary of stirring ethnic tensions, and the country remained on edge as a home-made bomb was defused at Colombo airport late Sunday and massive security deployed. A nationwide curfew imposed shortly after the blasts was lifted early Monday, but the government has ordered a two-day holiday and schools and the Colombo stock exchange were closed. Still, a steady stream of people and vehicles were seen on the streets of the capital and Negombo. The attacks were the worst ever carried out against Sri Lanka’s small Christian minority, who make up just seven percent of the 21 million population. At least 37 foreigners were among the dead, the foreign ministry said. The government said three Indians, three Britons, two from Turkey and one Portuguese had died, as well as two persons holding both British and US passports. “Additionally, while nine foreign nationals are reported missing, there are 25 unidentified bodies believed to be of foreigners,” the foreign ministry said. Japan’s foreign ministry said one of its nationals was among the dead. The churches targeted included St Sebastian’s in Negombo, north of the capital, which was surrounded by security forces on Monday. Dozens of people were killed at the church, including friends of 16-year-old Primasha Fernando, who was at her home nearby when the suicide bomber struck. “When I got to the church there were people crying and screaming,” she told AFP. The church’s roof was largely blown out and pews splintered. The floor was strewn with roof tiles and shards of glass. Outside, 24-year-old Denver Malewama and his mother Sunita handed out tea to security personnel. “We want to say thank you because they protect us,” he said. Some Sri Lankans asked how the attacks could have happened after it emerged that the government had been warned about possible blasts. Sri Lanka’s police chief Pujuth Jayasundara issued an intelligence alert to top officers on April 11, warning that suicide bombers from a group called National Thowheeth Jama’ath (NTJ) planned to hit “prominent churches”. The NTJ is a radical Muslim group in Sri Lanka that was linked last year to the vandalisation of Buddhist statues. Prime Minister Ranil Wickremesinghe said an investigation would look into “why adequate precautions were not taken”. The government said investigators would look into whether the attackers had “overseas links”. The government of Sri Lanka has imposed an 8:00pm to 4:00am curfew in Colombo, following the Easter day bombings of churches and hotels that has so far claimed over 290 lives. Government information department disclosed this on Tuesday. Meanwhile, Sri Lankan police have arrested two dozen people in connection with a string of bomb attacks on several churches and hotels that have claimed the lives of at least 290 people. The country went on lockdown on Easter Sunday after eight apparently coordinated blasts hit churches filled with worshipers as well as luxury hotels in the capital Colombo, and the cities of Negombo and Batticaloa. Police announced the dramatic rise in the death toll on Monday morning, saying some 500 people had also been injured in the attacks, the worst of their kind since the end of Sri Lanka’s devastating civil war a decade ago. There were 32 foreigners among those killed, including nationals from Britain, the United States, Turkey, India, China, Denmark, the Netherlands and Portugal. Three police officers were also killed several hours after the attack, when they raided a house in Colombo. Police reported an explosion at the house. Over 200 persons have been killed and 450 hurt in explosions at churches and hotels in Sri Lanka. Worshippers were celebrating Easter at three churches in Negombo, Batticaloa and Colombo’s Kochchikade district when the bombers struck. The Shangri-La, Kingsbury and Cinnamon Grand hotels and one other, all in the capital, were also targeted. Responding to the coordinated attacks, the authorities in Sri Lanka declared a national curfew and blocked social media networks temporarily. The police also announced the arrest of seven suspects. Ruwan Gunasekera, police spokesman, put the death toll at 207. “Altogether we have information of 207 dead from all hospitals. According to the information as of now we have 450 injured people admitted to hospitals,” he told reporters. President Muhammadu Buhari has expressed sadness over the attacks, calling on the authorities not to spare “the wicked elements”. In a statement which Garba Shehu, his spokesman, issued on his behalf, Buhari extended his deepest condolences to the families of those killed in the attacks and wished speedy recovery to the injured. “We stand with victims of terrorism all over the world because we know and understand this harrowing inhuman activity,” the president said. Sudan’s public prosecutor has begun investigating ousted President Omar al-Bashir on charges of money laundering and the possession of large sums of money without legal grounds, a judicial source told Reuters on Saturday. News Agency of Nigeria (NAN) reports that the former Sudanese leader was one of the sit-tight heads of government in Africa until he was forced out of office. The sit-tight act is playing out in Egypt where President al-Sisi is carrying out a referendum that will keep him in power until 2030. Special Counsel Robert Mueller may not have found evidence of a criminal conspiracy between Donald Trump’s 2016 campaign and Russia, but his report details extensive contacts between the campaign and Russian operatives who sought to influence the election. Mueller said in his report released on Thursday that he found “numerous links” and that the Trump campaign “expected it would benefit” from Russia’s effort to tilt the ballot in Trump’s favour. Ultimately, Mueller determined the various contacts either didn’t amount to criminal behaviour or would be difficult to prove in court, even if people in Trump’s orbit sometimes displayed a willingness to accept Russian help, the report showed. Trump and his allies, who derided the Mueller probe as a political “witch hunt”, portrayed the report as vindication. “No collusion. No obstruction. For all the haters and the radical left Democrats, game over,” Trump tweeted on Thursday. “The bottom line is the president is exonerated and the campaign is exonerated of collusion,” said Michael Caputo, a former adviser to Trump’s campaign. Some legal experts and political strategists were more circumspect, saying the report confirmed the Russian government was attempting to help Trump with the election. “I think that’s a pretty extraordinary finding of historical significance, whether or not there’s a crime,” said Matthew Jacobs, a former federal prosecutor who is now a San Francisco-based lawyer. Many of the contacts in the report were already known. They included former national security adviser Michael Flynn’s conversations in late 2016 with Sergei Kislyak, Russia ambassador at the time, and former Trump campaign chairman Paul Manafort’s interactions with Konstantin Kilimnik, a political consultant who the FBI has determined has ties to Russian intelligence. But the report contained fresh details on the range of official and unofficial dealings Trump campaign advisers and supporters had with Russians before and after the 2016 election. For example, the report says that Manafort, shortly after he joined the campaign in the spring of 2016, directed his deputy to share internal polling data with Kilimnik with the understanding it would be passed on to Oleg Deripaska, a Russian oligarch known to have close ties to the Kremlin. Lawyers for Manafort did not immediately respond to a request for comment. Kilimnik did not reply to an email seeking comment. A Washington-based attorney for Deripsaka said he could not comment. In a statement to Reuters in January, representatives for Deripaska said he has never had any communication with Kilimnik. The report also says that Manafort told Kilimnik in August 2017 about the campaign’s efforts to win the battleground states of Michigan, Pennsylvania, Wisconsin and Minnesota. Trump ended up winning three of those states in the November election. Mueller’s investigation did not find a connection between Manafort’s sharing of polling data and Russia’s meddling in the U.S. election or that he otherwise coordinated with Russia. Frank Montoya, a former senior FBI official, said he was nonetheless bothered by the interactions between Manafort and Kilimnik, especially their talking about battleground states. “As a longtime counterintelligence investigator it makes the hair stand on the back of my neck,” Montoya said. The report detailed a meeting in December 2016 between Trump’s son-in-law Jared Kushner and Sergei Gorkov, the head of a Russian state-owned bank under U.S. sanctions. Gorkov gave Kushner a painting and a bag of soil from the town in Belarus where Kushner’s family is from, the report says. Mueller’s team said it could not resolve a conflict in the accounts of Kushner, who said the meeting was diplomatic in nature, and Gorkov, who said it was business related. Kushner has said neither sanctions nor his business activities were discussed at the meeting. Kushner’s lawyer did not respond to a request for comment on Mueller’s report. The report also provided new details about a meeting that campaign advisers Donald Trump Jr., the president’s oldest son, Kushner and Manafort held with a Russian lawyer at New York’s Trump Tower in June 2016. The meeting was set up after the advisers were promised “dirt” on Hillary Clinton, Trump’s Democratic challenger for president. Mueller’s team considered whether the advisers violated laws barring election contributions from foreigners. But, the report says, they ultimately decided there was not enough evidence to show they “wilfully” broke the law and they might have had problems proving the information offered on Clinton was really valuable. When news of the Trump Tower meeting broke in July 2017, Trump Jr. issued a statement saying the meeting was set up to discuss adoption policy, not politics, before later admitting he had been expecting intelligence on Clinton. Such interactions have broadly been referred to by Democratic congressional investigators as examples of possible “collusion”. But because collusion is not a legal term, Mueller’s team examined the Trump Tower meeting and other contacts through the lens of federal conspiracy law. Mueller said his investigation was unable to establish that such contacts with Russians met the bar of criminality which required that the contacts “amounted to an agreement to commit any substantive violation” of U.S. laws, including those governing campaign finance and foreign agent registration. Uganda’s top court paved the way Thursday for the country’s 74-year-old leader Yoweri Museveni to seek a sixth term in office, upholding a ruling to scrap presidential age limits. The Supreme Court dismissed a challenge by Museveni’s opponents, who had appealed against a constitutional court ruling that removed an age cap of 75 for presidential contenders. “This appeal therefore fails,” Chief Justice Bart Katureebe declared in handing down the court’s majority 4-3 verdict. The decision allows Museveni — who has ruled Uganda since seizing power at the head of a rebel army in 1986 — to seek re-election in polls due in 2021. Attorney General Mwesigwa Rukutana declared the verdict “a big win for Uganda”. “We are elated. This is a sign of how democracy has taken root in our country,” he told AFP. But a lawyer for the petitioners, Erias Lukwago, said “it is democracy that suffers”. “It is a disappointment, but in Africa it is a miracle to win (against) a sitting government,” he told AFP. Observers had expected a ruling in Museveni’s favour, but the narrow margin came as a surprise. “The ruling was so close. Museveni will take a lesson from it,” said Kassim Male Mabirizi, an activist from the Uganda Law Society and one of the main petitioners. A bill removing presidential age limits was signed into law in December 2017 after a chaotic passage through parliament that saw MPs engaging in fisticuffs. That decision sparked protests and an outcry from the opposition, which accused the president of seeking to rule for life. The constitutional court upheld the amendment in a ruling in July last year, but it was challenged by the opposition in Uganda’s highest court. A seven-judge Supreme Court bench began hearing the appeal in January, with opposition lawyers arguing the bill was unconstitutional. Some of the judges agreed. “The power to amend is not the same as the power to rewrite the constitution,” said Justice Lillian Tibatemwa, one of the three judges who ruled for the opposition. Museveni once said leaders who “overstayed” were the root of Africa’s problems. But in 2005, he scrapped a two-term presidential limit which has allowed him to keep running for office. While contesting a fifth term in 2016, he said it was not the right time for him to leave as he still had work to do. In February, the ruling party endorsed Museveni as its candidate for 2021. He is the only president most Ugandans have known in a country where the median age is less than 16. But young Ugandans have recently been energised by pop star-turned-MP Bobi Wine, who spearheaded protests against the age-limit amendment and has rapidly become a thorn in the government’s side. Bobi Wine, whose real name is Robert Kyagulanyi, told CNN in an interview in February that he was “seriously considering” running for president in 2021. Kyagulanyi was charged with treason last August, along with more than 30 opposition politicians, over the alleged stoning of Museveni’s convoy after a campaign rally. During the campaign, Kyagulanyi’s driver was shot dead when soldiers from the elite presidential guard raided the hotel in which he was staying. The singer has accused the security forces of torturing and beating him while in custody and later received medical treatment in the US for the injuries he said he received. The authorities have denied the allegations. Mali’s prime minister, Soumeylou Boubeye Maiga and his whole government resigned on Thursday, four weeks after a massacre of some 160 Fulani herders by an ethnic vigilante group shocked the nation. “The President accepts the resignation of the prime minister and that of the members of government,” a statement from President Ibrahim Boubacar Keita’s office said. It gave no reason for the departure of Maiga, but legislators had discussed on Wednesday a possible motion of no confidence in the government because of the massacre and failure to disarm militias or beat back Islamist militants. The March 23 killings by suspected hunters from the Dogon community on Ogossagou, a village in central Mali populated by rival Fulani herders, were bloody even by the recent standards of Mali’s ever-worsening violence. They followed a deadly assault by jihadists on an army post that killed at least 23 soldiers, also in Mali’s central region, which was claimed by an al Qaeda affiliate that counts many Fulani herders in its ranks. Malian authorities have detained five people suspected of taking part in the massacre. But they have not yet succeeded in disarming the militia that many believe organized it, despite pledges by Maiga and Keita to do so. Mali has been in turmoil since a rebellion by Tuaregs and allied jihadists took over half the country in 2012, prompting the French to intervene to push them back the following year. Sudan’s ousted President Omar al-Bashir was transferred on Tuesday evening to Kober prison, a maximum-security prison notorious for holding political prisoners during his 30-year dictatorship, two prison officials who witnessed his arrival told CNN. Several other regime figures are being held at the jail and kept separately to Bashir, who is under intensified security measures, the officials said. The prison’s main yard has been well-known as a site for executions. “He would’ve been led past the same hangman’s noose where he sent people to meet their Lord,” said one of the prison officials.Sudan’s military has previously said that it would prosecute Bashir, who is wanted by the International Criminal Court (ICC), but would not extradite him. The long-time leader was ousted from power in a military coup last week. Bashir and other top officials were arrested in a sweep of regime figures. Bashir, former Interior Minister Abdelrahim Mohamed Hussein and Ahmed Haroun, the former head of the ruling party, will be charged with corruption and the death of protesters, two sources with direct knowledge of events told CNN. The three men are all wanted by the ICC for war crimes related to atrocities during the 2003-2008 Darfur Conflict, which claimed at least 300,000 lives. The military has dissolved the government and said it would remain in power for up to two years, despite large street protests against their rule. The ruling military transitional council faces mounting pressure from the international community to hand over power to a civilian government. On Tuesday, the African Union threatened to revoke Sudan’s membership unless the country’s military establishes civil rule within 15 days. Uganda is willing to offer asylum to former Sudanese President Omar al-Bashir should he apply, a state minister for foreign affairs on Tuesday said. Henry Oryem, Uganda’s minister of state for international affairs, told the parliamentary committee on foreign affairs that the ousted leader is a guarantor to the South Sudan peace process. “If Bashir applies for asylum here that is something the government of Uganda can consider because Bashir is a guarantor to our peace talks,” said. Oryem, while presenting the ministry’s budget requirements for financial year 2019 to 2020 said, Bashir and Ugandan president Yoweri Museveni are the guarantors to the peace deal in the neighbouring South Sudan. “We wish and urge that Sudan should remain intact whatever happens, no one should have aspiration or desire for Sudan to break. The minister said the authorities in Kampala were closely monitoring the ongoing events in Khartoum, where street protests have continued after the military removed Bashir from power last week. “We are watching Sudan very closely and we classify Sudan as our immediate neighbour. “The transition is very volatile and as far as we are concerned we urge the government in Sudan to respect the will of the people,” said Oryem. Notre-Dame cathedral, the iconic symbol of the beauty and history of Paris, was scarred by an extensive fire on Monday evening that collapsed part of its delicate spire, bruised the Parisian skies with smoke and further disheartened a city already back on its heels after weeks of violent protests. 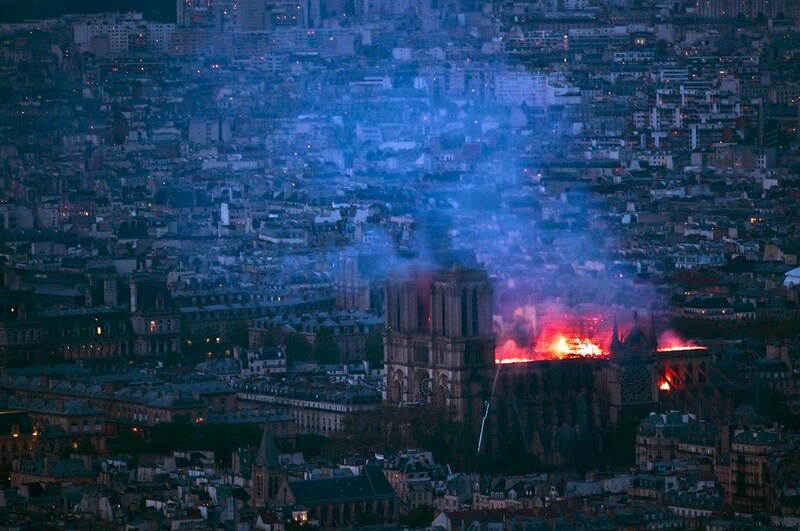 The cause of the fire was not immediately known, André Finot, a spokesman for the cathedral, said in a telephone interview, and there was no immediate indication that anyone had been hurt. But the spectacle of flames leaping from the cathedral’s wooden roof — its spire glowing red then turning into a virtual cinder — stunned thousands of onlookers who gathered along the banks of the Seine and packed into the plaza of the nearby Hotel de Ville, gasping and covering their mouths in horror and wiping away tears. The fire broke out about 6:30 p.m., upending President Emmanuel Macron’s plans to deliver an important policy speech about trying to heal the country from months of “Yellow Vest” demonstrations that had already defaced major landmarks in the capital and disfigured some of its richest streets. The tragedy seemed to underscore the challenges heaped before his administration that has struggled to reconcile the weight of France’s ideals and history with the necessity for change to meet the demands of the 21st century. France’s Interior Ministry said that 400 firefighters were battling the blaze. A jewel of medieval Gothic architecture built in the 12th and 13th centuries, Notre-Dame, others noted, was a landmark not only for Paris, where it squats firmly yet gracefully at its very center, but for all the world. The cathedral is visited by about 30,000 people a day and around 13 million people a year. “This is just horrible,” said Mohamed Megdoul, 33, a film producer. “A thousand years of history which is being wiped away,” he said brushing away tears. “This belonged to the whole world, and now it is disappearing,” he said. As the last rush of tourists were trying to get in for the day, the doors of Notre-Dame were abruptly shut without explanation, witnesses said. Within moments, tiny bits of white smoke started rising from the spire — which, at 295 feet, was the highest part of the cathedral. The French police rushed in and started blowing whistles, telling everyone to move back, witnesses said. By then, the flames were towering, spilling out of multiple parts of the cathedral. Tourists and residents alike came to a standstill, pulling out their phones to call their loved ones. 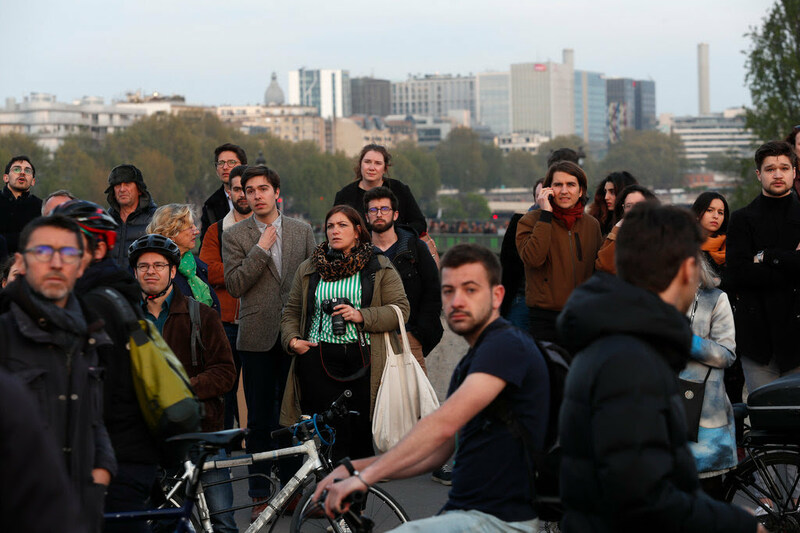 Older Parisians began to cry, lamenting how their national treasure was quickly being lost. Thousands stood on the banks of the Seine river and watched in shock as the fire tore through the cathedral’s wooden roof and brought down part of the spire. Video filmed by onlookers and shared on social media showed smoke and flames billowing from the top of the cathedral. “The Paris firefighters are currently trying to stop the flames,” Ms. Hidalgo said. “I ask everyone to respect the security boundaries. The Paris prosecutor’s office said it had opened an investigation. The Paris police warned people to stay away from the area around the cathedral. City Hall announced around 8:30 p.m. that all roads on Île de la Cité, the island in the heart of the city where Notre Dame is, were closed. The cathedral is currently undergoing extensive renovation work. Last week, 16 copper statues representing the Twelve Apostles and four evangelists were lifted with a crane so that the spire could be renovated. Glenn Corbett, an associate professor of fire science at John Jay College in New York, said that construction work and renovations had long been a dangerous combination. A London judge has found WikiLeaks founder, Julian Assange guilty of failing to surrender to bail in 2012. He will now be sentenced on May 2. Assange had pleaded not guilty to the charge, which stems from the time he sought refuge in the Ecuadorian embassy in 2012, avoiding extradition to Sweden for a sexual assault investigation, rt.com reported. Although Swedish authorities dropped the charge in 2017, Assange remained wanted by Britain for breaching the terms of his original bail. The WikiLeaks chief faces 12 months in prison for failing to surrender, and will be sentenced via video link on May 2. Separate from the British charge, Assange is also wanted for extradition by the United States. Although Washington quietly requested his extradition in 2016, the US Justice Department announced conspiracy charges against Assange on Thursday, stemming from his role in publishing classified military documents leaked by US Army whistleblower Chelsea Manning in 2010. Assange faces a “federal charge of conspiracy to commit computer intrusion for agreeing to break a password to a classified U.S. government computer,” according to the Justice Department. Rather than actually hacking into government networks himself, Assange is merely accused of encouraging Manning to do so. The British judge said on Thursday that the US must produce its case for Assange’s extradition by June 12. His alleged crimes fall under the Computer Fraud and Abuse Act, rather than the Espionage Act. However, activists have warned that the US government may attempt to tack on additional charges to punish Assange.